Looks like Crown Lynn stamp - but is it? Those very annoying low 500's again! Was looking at this vase, looks like Crown Lynn numbering, but is it? Re: Looks like Crown Lynn stamp - but is it? Those very annoying low 500's again! At last a tell tale sign that tells me that these low 500's numbered like Crown Lynn are really Titian! Crown Lynn never used that 'crackle glaze' as far as I know, but Titian used it on many items. Ev wrote: At last a tell tale sign that tells me that these low 500's numbered like Crown Lynn are really Titian! Ah!! 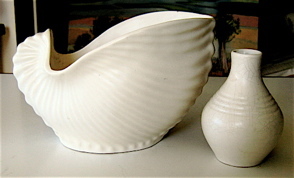 now it is all revealed , I have a very similar vase but with less flair out at the top. and marked .506. with same 'hand' as the one on Trademe. I bought as Crown Lynn but have long been of the opinion that it is not, as quite different to the CL shape listed on the Forum. the 4 rings are quite distinctive. 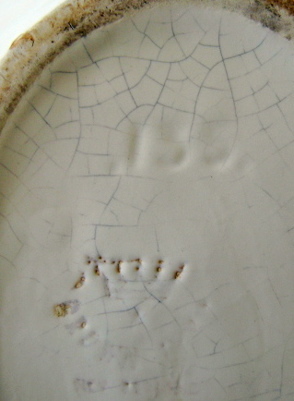 The writing of the numbers on CL pieces and this pot are different also particularly the size of the digits very large on these two quite small pots also the way the dots are drawn. 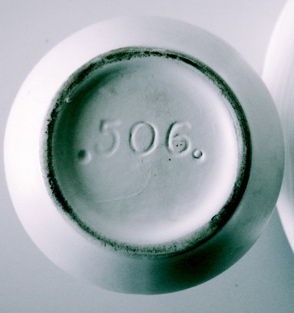 My 506 also has the 'crackle glaze' which on first site looks like crazing but is more pronounced and is 'larger'. 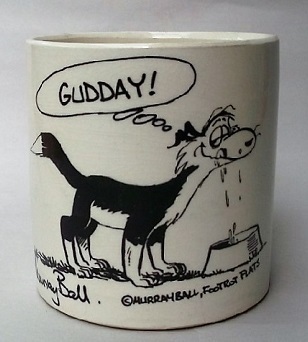 Gail Henry mentions that one must be careful if there is no makers stamp on pieces and only numbers with dots, as Vic Lawson who introduced the numbering system with dots either side at Crown Lynn, also worked for Titian Studios where he also practised this same method. It ended up selling for $40.50, amazing isn't it. I hope the buyer read the measurements correctly and isn't disappointed when they get it. I tried to make buyers aware, but that is all one can do. omg at the comments !! This guy hasn't bothered me for years and now I'm all creeped out again!! MMMMM!!!!! Caveat Emptor seems to fit here.